NEW YORK -- Jet-setting stallions and high-flying hounds at New York's Kennedy Airport can look forward to a new luxury terminal that will handle the more than 70,000 animals flying in and out every year. The ARK at JFK, its name inspired by Noah's biblical vessel, will more than measure up to terminals for humans: Horses and cows will occupy sleek, climate-controlled stalls with showers, and doggies will lounge in hotel suites featuring flat-screen TVs. A special space for penguins will allow them mating privacy. The ARK is billed as the world's first air terminal for animals. Set to open next year, the $48 million, 178,000-square-foot shelter and quarantine facility will take in every kind of animal imaginable - even an occasional sloth or aardvark. From here, they'll head to barns, cages, racetracks, shows and competition venues in the United States and abroad. Many arriving animals are quarantined for a period of time (for horses, it's normally about three days) to make sure they're not carrying contagious diseases. And The ARK is designed to make their stay as pleasant as possible, with hay-lined stalls for up to 70 horses and 180 head of cattle, plus an aviary and holding pens for goats, pigs and sheep. 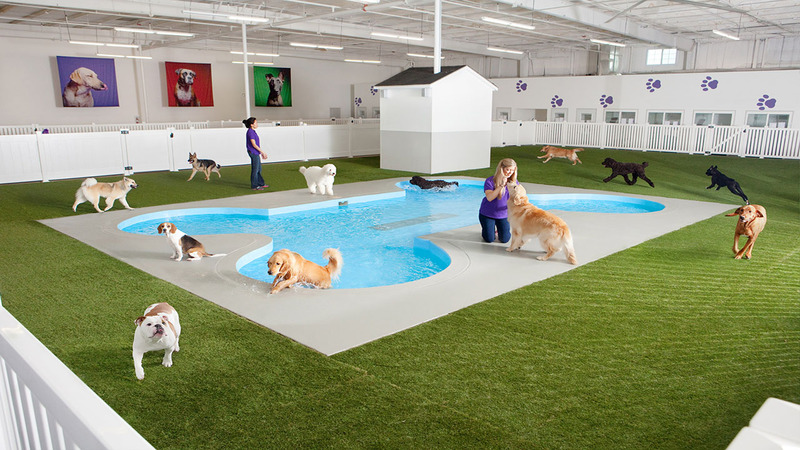 For dog owners, The ARK will offer a 20,000-square-foot luxury "resort" run by the company Paradise 4 Paws, complete with bone-shaped splashing pools, massage therapy and "pawdicures with colored nail pawlish." Dogs can watch flat-screen TVs and their owners can check in on them via webcam. Cats will have their own trees to climb. And all animals will have access to a 24-hour clinic run by Cornell University's veterinary college. Even animals that don't need to be quarantined - a huge dog that can't fit in the cabin and has to travel as cargo, for example - will be held at the facility until departure or pickup by its owner. "A lot of our design making is in collaboration with veterinarians and consultants to help minimize the amount of stress placed on the animal," said Cliff Bollmann, a leading airport architect working on The ARK for the San Francisco-based architecture firm Gensler. Kennedy receives the bulk of animals entering the United States, but there are similar facilities near airports in Chicago, Los Angeles, Miami and San Juan. Until Kennedy's ARK opens, animals in transit will continue to be handled at the airport's aging 10,000-foot Vetport, built in the 1950s. Lachlan Oldaker, an Oklahoma-based equine specialist and key member of the architectural team, called The ARK "an enormous leap forward." "The design allows planes to taxi directly to the building, so horses can be transported in a seamless fashion that reduces stress," she said. The ARK is being built on the site of an unused cargo terminal that has been demolished. ARK Development, an affiliate of the Madison Avenue real estate company Racebrook Capital, has signed a 32-year lease for the airport property with the Port Authority of New York and New Jersey agency that runs Kennedy. When completed, the facility is subject to approval by the U.S. Department of Agriculture. Animals will be charged fees - still being determined depending on services - that will help fund the terminal. High-end dog "suites" could top $100 per night. Transporting animals by air is not aimed at low-income owners. A flight to London for a dog can cost about $1,000, plus a crate, airport fees and vet certifications. And moving a horse can add up to at least $10,000. The ARK's designers have had to meet challenges not found in other architectural projects - for instance, figuring out how to dispose of animal waste. They came up with the idea of a "poo chute," an angled floor from which manure slides into a container. Among the supporters of this unusual animal kingdom is Dr. Richard Goldstein, the chief medical officer at New York's Animal Medical Center, which treats sick animals of all species from around the world. "Our veterinarians have often been in a position of having to arrange transport for many of our traveling patients at all hours of the day and night, and will look forward to working with The ARK to make this experience better for everyone involved," Goldstein said. But even when it comes to healthy animals, the equine wing is a welcome improvement to international show jumper and organizer Derek Braun. Horses must currently be driven to a quarantine facility in Newburgh, about 80 miles north of Kennedy. The ARK has an in-house quarantine. "I personally, as well as competitors for my shows, ship so many horses from Europe each year that having the peace of mind that one step of the travel process will be eliminated is a big relief because it eliminates part of the risk of injury," he said.